For an owner that fancies an unusual refit project, this experimental, military-specification 32 metre SWATH vessel may be just the ticket. The boat is said to give a flat ride whatever the sea state, and she is selling for $180,000, around $14.82 million less than her reported build cost. The HSV Sea Slice is lying in San Diego, California. The extraordinary machine was designed and built 12 years ago for military or commercial use, but with some imagination and a skilled interior designer, she could be transformed into the ultimate superyacht – as ideal for fast passage-making as she is for large al fresco parties. 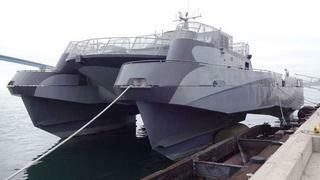 Sea Slice was designed by defence contractor Lockheed Martin and built by Pacific Marine. She is driven by four separate underwater pod drives, and motion control sensors mean the boat has a desirable level of stability even in rough conditions and travelling at speeds of up to 30 knots. Early on she was used to trial cutting-edge anti-mine warfare methods, as well as during amphibious beach assaults and also warship defence at sea, where she was able to position herself at speed between enemy small boats attacking a US warship, in mock warfare situations. The technology and the boat was heralded as a success and further naval research and development in the field was expected. Sea Slice is currently under offer. The 180 ton boat is 32 metres long and 17 metres wide (55ft). Her top speed of 30 knots comes via two MTU 16V396 TB94 diesel engines rated at 3480hp each. Sea Slice’s original 35mm naval armaments have been removed. The seller says she will give “unrestricted operation to sea state 5” and that she is operational to sea state 6. On board motion is comparable to a boat three times as large. Down below there are bunks three-high in the sleeping quarters and a functional galley. While the interior leaves a little to be desired in terms of superyacht luxury, Sea Slice offers a remarkable platform on which to build the ideal SWATH-hull superyacht. The yacht is currently under offer with the sale pending, stay tuned for more details of the sale of this potential new project as they come available.